Some of the world's most famous LGBT performers starred in Vegas shows way before anyone was talking about marriage equality or transgender rights. Image above: Starbust: the Superstar Aid for AIDS Benefit, sponsored by Aid for AIDS of Nevada, took place in the Continental Theatre at the Stardust on June 14, 1987, and featured numerous celebrity performers. Sahara: On November 3, 1953, controversial transgender performer Christine Jorgensen, billed as “The World’s Most Talked-about Personality,” opened in the Sahara Hotel’s Congo Room. Silver Slipper: Boylesque opens at the Silver Slipper Casino’s Gaiety Theatre on Friday, May 13, 1977, setting a new standard for female impersonation productions. El Cortez: In November 1953, world-famous impersonator Lynne Carter, noted for his dead-on impersonations of female icons such as Pearl Bailey, opened in the Pirate’s Den lounge at the downtown El Cortez Hotel and Casino. Flamingo (pink feathers): In July 1970 famed female impersonator and five-time Las Vegas Entertainer of the Year Jim Bailey, best known for his Judy Garland impersonation, opened in the Flamingo Casino Theatre where he performed to sold-out audiences. 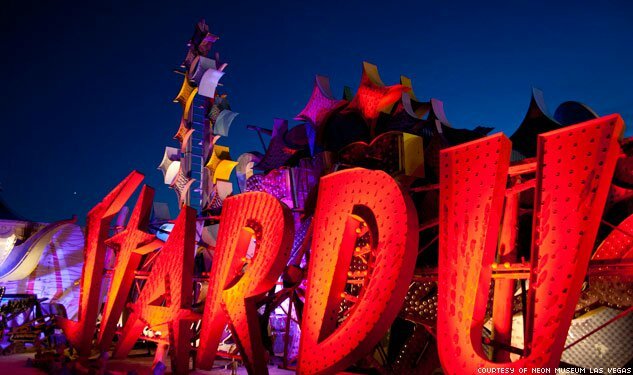 See more pictures of Neon Museum Archives on the next page.